I first learned about kkotppang when I lived in Columbia, Missouri in the 1990s. Our Korean expat group used to have a potluck meeting. The expats came from all over Korea, so it was a good chance for me to taste some regional Korean dishes. Someone brought kkotppang one day, and I had never seen them before so I was really curious about the buns. She said she bought them from a Korean grocery store. I found out it was a Chinese-Korean dish. Chinese immigrants living in Korea have developed all kinds of Koreanized Chinese recipes like jjajangmyeon, jjamppong, and tangsuyuk, dishes inspired by Chinese recipes but modified to Koreans’ taste using ingredients in Korea. Koreans eat kkotppang as a side dish with stir-fried meat and green chili peppers or chives. We wrap the items in soft kkotppang and eat them. You can do the same thing and wrap dishes like bulgogi or spicy stir-fried pork in kkotppang and pop them in your mouth! At home, after tasting the kkotppang at that party in Missouri, I tried to recreate them in many ways. 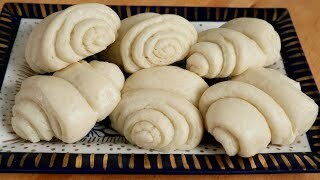 After a lot of experiments I succeeded in making pretty flower-shaped, wrinkly, fluffy buns. I still remember it! “Yay, I can make kkotppang!” I said. I hope you feel the same way when you make these bun. Enjoy their fluffiness! Combine warm water, sugar, and salt in a large bowl. Stir and mix to dissolve the sugar and salt. Add the dry yeast and let it sit for 5 to 10 minutes until the yeast gets foamy. Add 2 cups flour and mix well with a wooden spoon until it turns into a lump. Knead the dough by hand for a minute. Cover and let it sit on the kitchen counter for 1 hour to 1½ hours, until the dough doubles in size. Deflate the dough and then knead for a minute. Cover and let it sit for another hour. Deflate the dough and knead it until it’s smooth. Shape it into a nice smooth ball. Use the remaining 2 tablespoons of flour to dust your dough and cutting board. Sprinkle some flour on the board and place the dough ball on top of. Roll it out with a rolling pin into a flat rectangle about 13 inches wide (33 cm) and 14 inches (35 cm) deep. Brush about 1 tablespoon vegetable oil all over the dough except for a 1 inch strip on the far end. And sprinkle with 1 tablespoon sugar. Roll the sheet up to the un-oiled edge and then pinch the edge to seal it to the roll. Flip it over so the sealed side is down and cut the roll into 6 to 7 equal sized pieces. Brush a chopstick (or wooden skewer) with the leftover vegetable oil. Set the chopstick on the middle a piece of dough and then press down, shaping the roll into a flower bloom. Put it on the steamer basket lined with wet cotton cloth or steamer liner. Repeat with the rest of the dough pieces, spacing them 1 inch part so they have room to expand. Let them rise for 30 to 40 minutes. Meanwhile, fill your steamer with about 2½ inches of water and bring to a boil. Turn off and wait until the dough has totally risen. When the dough is ready, reheat the water in the steamer and put the steamer basket with the buns inside. Put a large cotton cloth under the lid so that the water doesn’t drip back down onto the buns. Cover and steam over medium high heat for 10 minutes. Remove from the heat and serve right away. You can freeze some leftover buns. When you serve them again, steam them for 10 minutes to make them fluffy again. Or put them in the microwave for 1 minute. Posted on Monday, September 24th, 2018 at 8:19 pm. Posted November 9th, 2018 at 2:23 am | Log in to reply. Posted November 16th, 2018 at 8:38 am | Log in to reply. Oh my, it looks amazing! You made perfect kkot-ppang and the flowers in the background match! Clap clap! Posted October 29th, 2018 at 4:39 pm | Log in to reply. I’ve just finished making my 1st batch of kkotpang but mine look a bit more brown and saggy compared to yours. What do you think I did wrong? I used all purpose flour(not bleached). Should I have used s different flour? Posted October 29th, 2018 at 4:42 pm | Log in to reply. Posted October 1st, 2018 at 2:57 am | Log in to reply. Hello Maangchi, thank you so much for this easy-to-follow recipe and video. I followed all your steps exactly and my first attempt at making kkotppang was a success! They not only looked nice and fluffy, but my mom even complimented me by saying the banjook (dough?) was well done. She said the kkotppang reminded her of some anko ppang she made for my sister and me when we were very young. I don’t remember it, but I’m glad that your kkotppang brought back some good memories for my mom. Thank you so much. Now that I’ve got the kkotppang down, I’m going to try making it again next time with some kind of savory or sweet stuffing. Posted October 3rd, 2018 at 8:44 am | Log in to reply. I’m editing my video for buchu-japchae at the moment, so you will have something to enjoy your kkotppang with. Posted September 24th, 2018 at 11:22 pm | Log in to reply. Posted October 1st, 2018 at 3:06 am | Log in to reply. 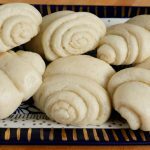 This recipe was originally posted on September 24, 2018 at 8:19 pm by Maangchi. The video was watched 292,393 times on YouTube & has 10,243 likes!